Off-leash dogs can be a major source of dog bite injuries in the United States. Even well-trained or friendly dogs can cause a number of issues if they aren't leashed. The real problems often arise as a result of the environment, not your dog; as such, it's important you take the correct precautions when you bring your dog outside, namely, keeping them tethered to your side via a leash. Even in situations where dogs are allowed to be off-leash, it's essential you have a plan in place should your dog attack, be attacked, or cause an emergency situation. Irresponsible dog owners don't often think about the repercussions that might result because of their dog being off-leash. However, leashing your dog is the law for a reason. 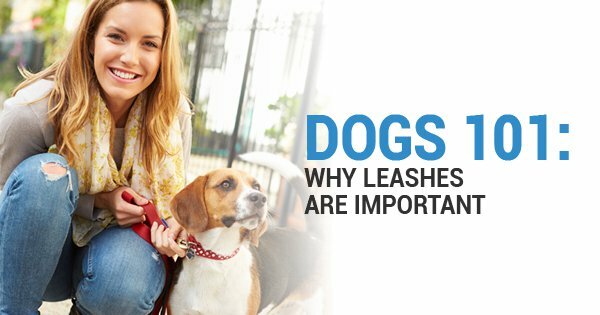 Here are some of the top reasons to leash your dog outside. Even if your dog is mild-mannered, that doesn't mean every dog you come across will be. Countless animals are taken outside for exercise and the associated health benefits, but your dog's presence might cause an issue. In the event your friendly dog happens to approach an unwelcoming leashed pet, you're still going to be the one at fault should your dog get bitten. This is because the owner of the other dog was following the law while yours was not. At the end of the day, you never know how other animals are going to react to your pet. You might run into a territorial dog, a stray cat, or even a friendly dog that happens to have a moment of aggression. Your dog might also react to an animal in heat or get territorial himself. Regardless, it's safer to keep your dog on a leash and harness to prevent any injury between fellow dog owners. Irresponsible dog owners may think everyone likes dogs. After all, your pooch is friendly, outgoing, and wouldn't hurt a fly. However, you never know when someone is going to be uncomfortable because of the presence of your pup. Whether they are scared of dogs, allergic, or simply doesn't like dogs, this can cause a number of issues for you as a pet owner. If your dog approaches someone that doesn't welcome their presence, you never know what's going to happen. The other person may react out of fear or anger and cause injury to your dog, especially if a seemingly random dog approaches them off-leash. Another person may run away, prompting your dog to want to play; this might even result in a dog bite or other injury should your pooch get too playful. Your dog might even bite someone out of aggression even if they've never bitten someone before. Should that person be seriously injured and contact a dog bite attorney, you may have a legal case on your hands. To avoid being a bad neighbor, keep your dog on a leash. A distracted dog that happens to be off-leash is more likely to run into traffic. Even if your dog is well-trained, a funny smell, a running animal, or a friendly person might prompt them to veer off your well-trodden path. This can result in serious injury to your dog or cause a major accident on the road should someone swerve to avoid them. Someone might get hurt in a car accident, or you might get sued for being an irresponsible dog owner. By keeping your dog at your side with a leash, you're keeping everyone safe. It's common for dogs to veer out of your sightline, especially if you're at a park or other open space. Though they're less likely to get hit by a car, this also means your dog is more likely to get into things they shouldn't: namely, the garbage. Garbage cans and litter surround many public areas and dogs are natural scavengers. In the event your dog eats something it shouldn't, you may have costly medical bills on your hands. Even if your dog is interacting with someone who likes dogs, frail people might not be able to withstand the energy from your dog. An excited pup might jump, lick, and scratch someone who isn't able to handle it. This might include smaller children, sick individuals, and the elderly. To control these amicable interactions and reign in your dog when needed, use a leash to prevent the need for a dog bite attorney. Failing to clean up after your dog can result in a hefty fine. By keeping your dog at your side, you'll be better able to notice when your dog needs to relieve itself. If you fail to clean up after your dog, it can result in a fine of several hundred dollars to several thousand dollars depending upon where you live. At the end of the day, dog leash laws are necessary, not because of your dog, but because of the environmental factors surrounding it. You never know who might react to your dog adversely and it's always possible for your dog to act out of character, especially when new stimuli are introduced. An estimated 4.5 million dog bites occur every year in the United States, resulting in costly court cases with a trained dog bite attorney. Whether you're suing because you've been bitten, or you're the owner of the dog that bit, contacting a dog bite attorney is the first step to ensuring your protected under the law. For more information on leash laws, irresponsible dog owners, and dog bite victims, contact dog bite attorney, Patrick O'Hara, today.